Wasps in the family Cynipidae are gall inducers on plants, or inquilines of gall inducers (living inside the galls made by other cynipids). 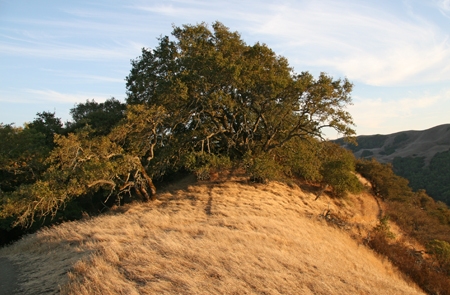 The majority of species occur on oak trees (Quercus sp.). Galls range in size from 1 mm to 6 cm or more and come in many shapes and colors, as depicted on this page. Different cynipid species occur on specific oak species, and the galls themselves occur on specific locations on the trees (leaves, stems, buds, roots, etc.) depending on the species and which generation it is. Some species have two generations per year, a sexual and an asexual (female only) generation, each producing completely different types of galls on different parts of the host. The adult wasps are generally around 1-4mm in size. The wasps support a community of other insects that feed on them, their parasites, and their galls. Regarding the generic names I'm using on this web site, please read this page. See also the undescribed or unknown oak gall page. This gall has been seen on Q. virginiana in Manteca, Stockton, Brentwood, and Sacramento. It has also been seen in Los Angeles County. For more information about California galls, see the Field Guide to Plant Galls of California and Other Western States by Ronald Russo.